Historical Reads: "The Best Way To Mend A Broken Heart Is Time And Girlfriends." 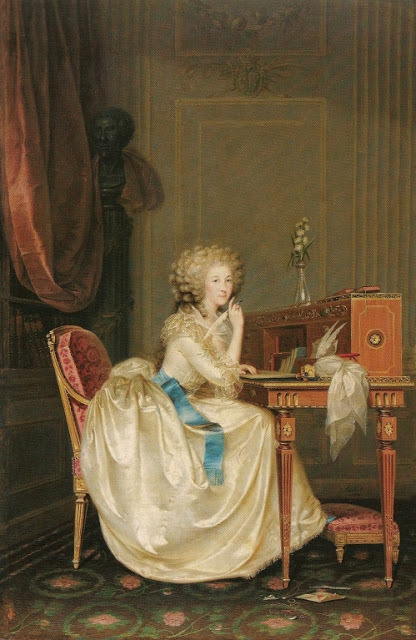 For better or for worse, the Princess' heartbreak over the death of her husband, who died in her arms, led to her friendship with Marie Antoinette. In her own words, "It was amid this gloom of human agony, these heart-rending scenes of real mourning, that the brilliant star shone to disperse the clouds, which hovered over our drooping heads… it was in this crisis that Marie Antoinette came, like a messenger sent down from Heaven, graciously to offer the balm of comfort in the sweetest language of human compassion. The pure emotions of her generous soul made her unceasing, unremitting, in her visits to the two mortals (she and her husband's grieving father) who must else have perished under the weight of their misfortunes…. From that moment I became seriously attached to the Queen of France."